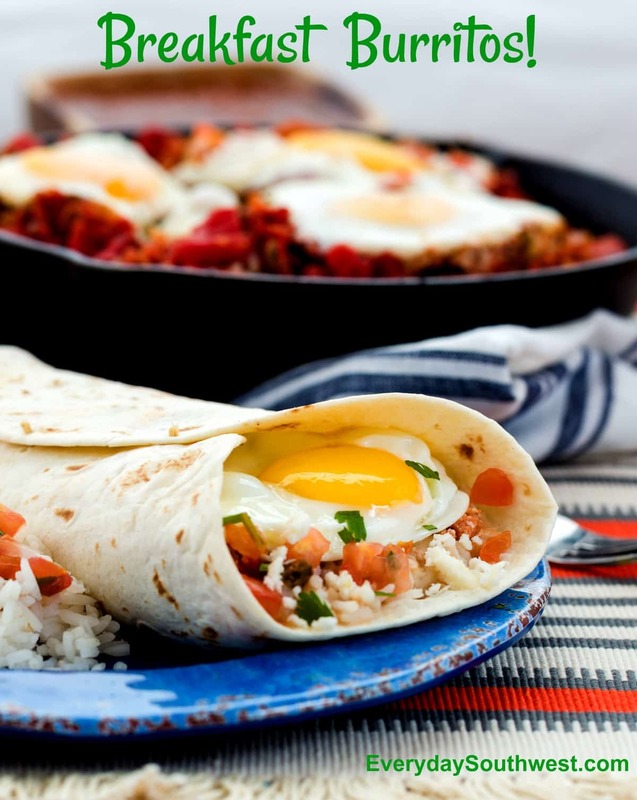 Eggs simmered in roasted vegetable salsa with sausage or chorizo then wrapped in a warm flour tortilla with rice and beans. Delicious! This Breakfast Burritos Recipe is healthy, fast and it will be your favorite go-to Breakfast Recipes. In our crazy fast-paced lives, there is little time for breakfast. Just grab a yogurt or a handful of granola and everyone is out the door to meet the day. If we are lucky, there is time to throw a frozen Breakfast Burrito into the microwave and eat it on the run. But then… there is the weekend. There is enough time to do breakfast right. Or a weeknight! Don’t forget weeknights for the delicious brunch recipe you wish you had time to cook. Breakfast Burritos for dinner? You bet! This Huevos El Diablo Breakfast Burritos Recipe is perfect for a comforting meal after a hard day. 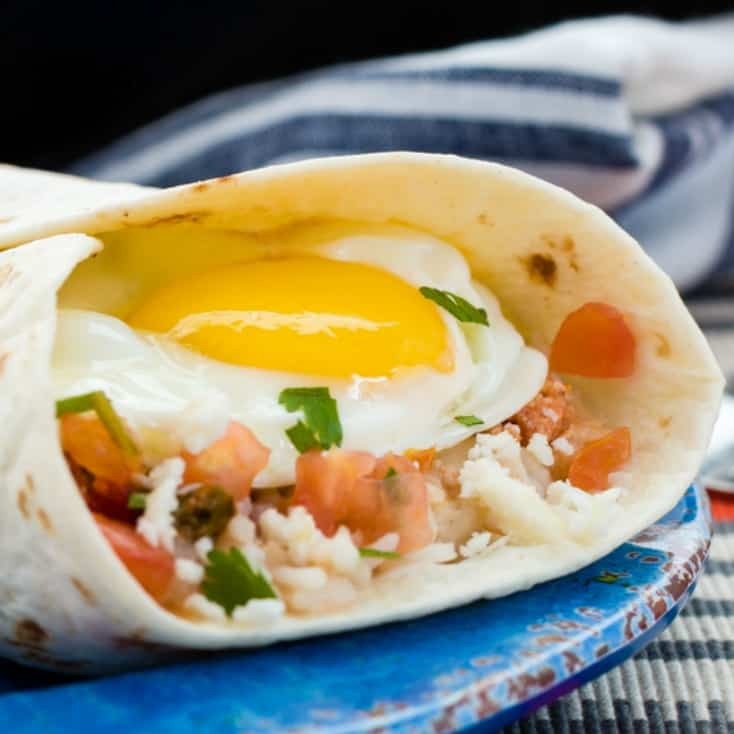 This breakfast burritos recipe is not your momma’s burrito. A perfect egg simmered in a roasted vegetable salsa with sausage or chorizo then, wrapped in a warm tortilla with beans and rice. Perfect. Huevos El Diablo Breakfast Burritos Recipe featured in my cookbook, Burritos! 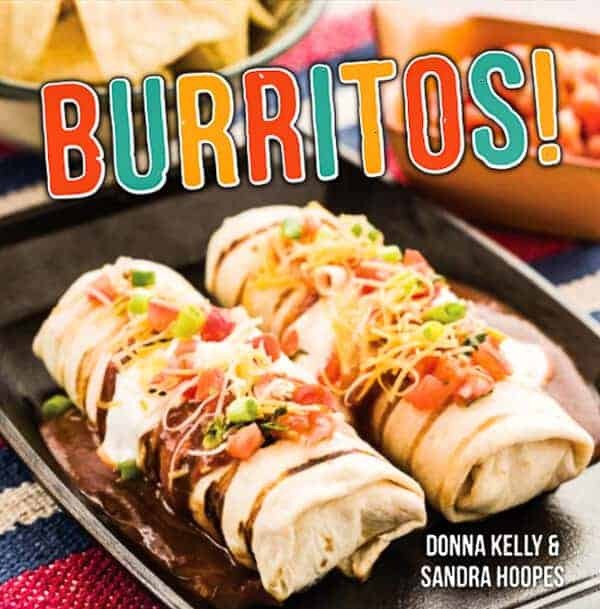 I wrote the cookbook BURRITOS! 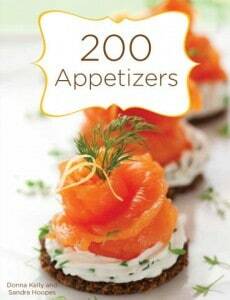 with my sister, Donna Kelly, and have featured a few of the recipe here on Everyday Southwest. Burritos! is filled with innovative recipes that feature flavors from around the world. Flavors from Asia, Morocco and back to the Ol’ Southwest. PLUS dessert! Don’t forget dessert burritos! This Huevos El Diablo Breakfast Burritos Recipe is my all-time favorite breakfast recipes ever and was inspired by my Huevos El Diablo Recipe here on the blog. Instead of spooning the sauce and egg over potatoes, I added sausage to the original recipe then, wrapped it up in a tortilla with rice and beans (beans are always optional in my world). 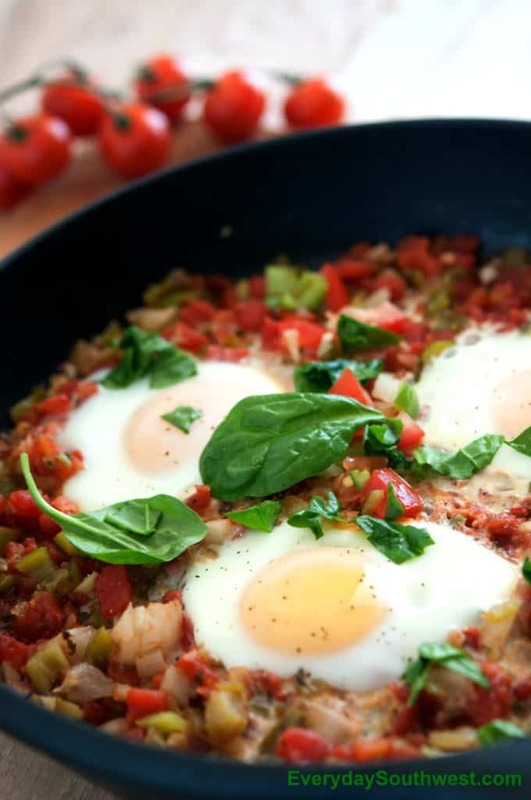 You can get the original Huevos El Diablo Recipe here. Don’t be afraid! Simmering the eggs is the easiest way I know to get a delicious poached egg. PLUS simmering the eggs in sauce adds flavor to the egg. Save time in the oven- by cutting the vegetables in half, toss them in a little vegetable or corn oil then, place them face down on a sheet pan to roast in the oven. For a mild sauce- remove the seeds, stems and ribs of the chiles. Roast the vegetables- until the skins are bubbled and charred. Remove from oven. Remove the skins easily- by putting “hot from the oven” vegetables in a heatproof bowl and cover the bowl with plastic wrap to steam. When they are cooled enough to handle, peel away the skins. You may not get every bit of the skins, but that’s ok, it is a rustic dish. Save more time- pulse the veggies in a food processor (NOT a blender) until chunky. Pour into a large saute pan and bring to a simmer. Make a “nest” for the eggs by making indentations in the veggies with the back of a large spoon. REMEMBER! The sauce will continue to reduce as the eggs poach. SO, If you have a large batch of eggs to cook, start BEFORE the liquid is reduced and the sauce is too thick. Cook the eggs to YOUR favorite temperature. I love runny, sunny-side up eggs but, my family likes the yolk cooked through. It is easy to adjust for each person. Save MORE time! Use leftover rice and beans. I ALWAYS cook more rice and beans than we need so that I can use them in other dishes throughout the week. Heat your fresh flour tortillas BEFORE rolling the burritos so that the tortillas are soft and will bend without cracking. This truly is my favorite Breakfast Burritos Recipe. I make it every chance I get. I hope you love it too! If you have any questions about the recipe you can always ask by leaving a comment here on the blog OR you can follow Everyday Southwest on Facebook and leave a comment there. 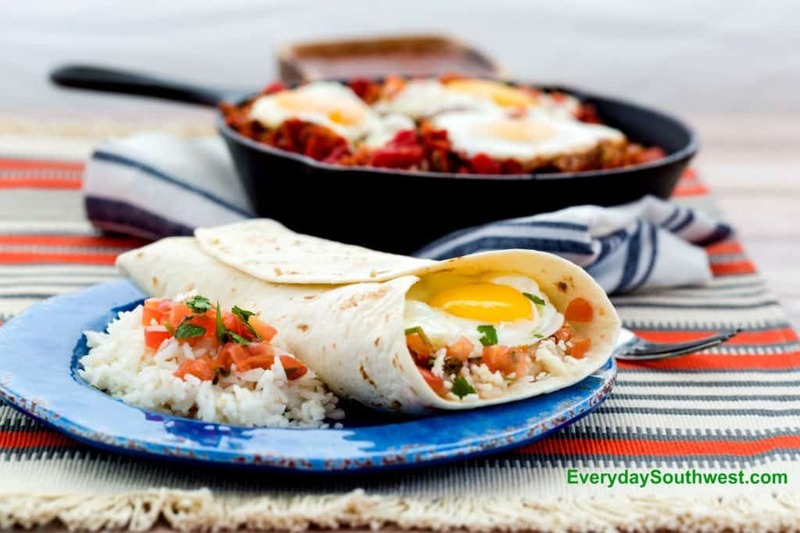 Perfectly cooked eggs in a spicy sauce with sausage or chorizo make these Breakfast Burritos a delicious meal for breakfast or dinner. Rice and whole beans round out the filling for Burritos El Diablo! Toss tomatoes, onion, and jalapeños with 2 table- spoons vegetable oil in a large bowl. Spread on a baking sheet, cut sides down, and season with salt and pepper. Broil until skins begin to turn dark brown, 6–8 minutes. Remove charred skins and pulse in a food processor to make a chunky sauce. Heat remaining oil in a large skillet over medium- high heat. Add oregano, red pepper akes, and garlic and then cook until fragrant. Add sauce to skillet and bring to a boil. Reduce heat to medium low and crack eggs into sauce, one at a time. Cook until eggs are desired doneness and season with salt and pepper. Mash beans with a potato masher or fork, until chunky, then stir in butter until melted. Assemble burritos by spooning beans on tortillas. Add 1 egg and sauce. Sprinkle with queso fresco and cilantro. Roll burritos as desired. These burritos look and sound amazing! I love the extra flavors and these are right up my alley when it comes to breakfast or even dinner because sometimes we do that! Can’t wait to try them! I love the flavor of these burritos! Thanks for the recipe! My husband declared this his new favorite breakfast. Great flavor, super satisfying.